What is a Speckle Park? The Speckle Park breed is growing in numbers and appreciation for the superior qualities they bring to seedstock breeders and commercial cattlemen in Canada, Australia, and the USA. Today there are more than 70 members and 3000 registered cows in Canada alone. 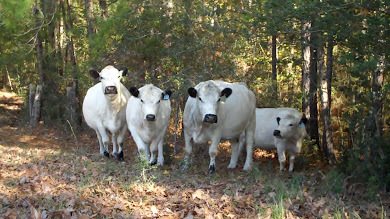 When one reads the description of this breed and views photos of examples of the breed, you could just as easily be reading a description of the polled British White cattle breed, with the exception of color standards. This breed embraces both the overmarked (linebacked), the roan (leopard) type, as well as the white Speckled Park. 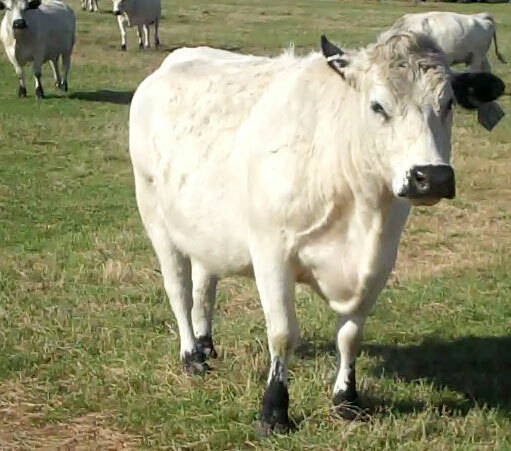 In the British White breed we see all three types born in our herds, but focus on the white type, rather than breeding for a predominance of line-backed cattle. 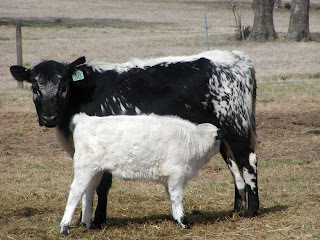 The photos you see here are of British White cattle exhibiting the same color patterns of the Speckle Park breed. 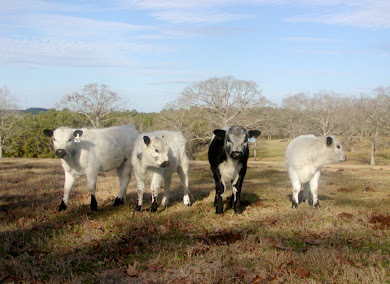 With the exception of the example of the 'leopard' or 'roan' hair coat, all pictured are American Fullblood British Whites. The roan example is a 2nd Gen purebred heifer named Bluebell. She calved a snow white, perfectly marked heifer calf this spring, and I don't expect to see the roan pattern occur again in the offspring of this new 3rd Gen Purebred heifer. The Speckle Park breed was formally recognized as a Purebreed by the Canadian Minister of Agriculture only as recent as 2006. 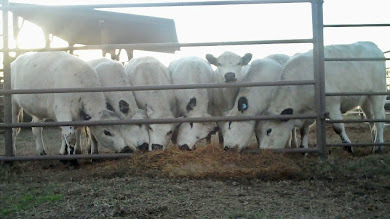 In the preceding many years, the breed's owners were hard at work "stabilizing, refining, and perfecting the breed", and thus establishing seedstock that will breed true to type for those qualities important to the survival of all cattle breeds - superior confirmation and carcass quality. The docile nature and maternal excellence of the foundation seedstock was undoubtedly not difficult to perpetuate, as those traits are highly heritable in the polled British White, once known as the polled Park, or polled White Park. Speckle Park cattle come in a variety of color patterns. 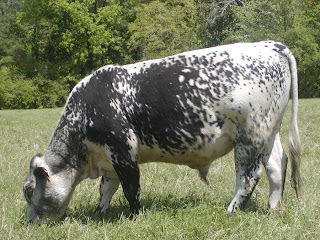 They are predominantly black with white top line and underline, with speckled hips and sometimes shoulders and with a black or black roan face. The second color pattern is the leopard pattern. 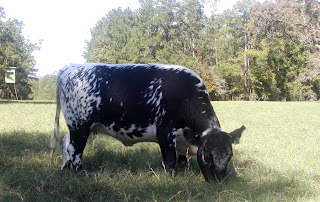 It is similar to the speckled pattern but there are definite black spots on the animal instead of just speckles. The white animals with some black hair on the body are considered 'leopards'. The third color pattern is the 'white' pattern. The white animals have white hair on the body and face but have black points. i.e. eyes, ears, nose, and hooves. The fourth is solid black. There is a very small percentage of blacks but they do crop up from time to time. The solid black heifers are registrable and can be used in the purebred herd, but the bulls can not. With their fine skin and hair in summer and a quick to 'slick off' hair coat, Speckle Parks adapt well to the Canadian summers as well as being able to 'coat up' when needed for their notoriously cold winters. They are tough, real tough, you can throw any harsh climatic situation at them and they survive, get back in calf, rear a good one, yet are so easy to feed and come back in condition quickly after hard times, traits that will stand them in good stead in Australian's harsh environment. In Canada butchers and meat graders are very impressed with the consistently high quality of the Speckle Park carcass. It isn't uncommon to get an exceptionally good carcass from any breed, but what is IMPRESSIVE is when the carcass from a particular breed is consistently good. That is the case with the Speckle Park. Another IMPRESSIVE fact about the Speckle Park is their UNIQUE ability of being able to achieve a AAA carcass without excess outer fat cover. Most breeds are able at achieve AAA carcass but often at the expense of excess outer fat. Speckle Park can achieve a AAA carcass with minimal fat cover, thus grading YG1-AAA. The key to more weight gain and less stress on man and beast. Are you sick of being kicked from pillar to post and pushed around the yards when you should be doing the pushing? Speckle Parks are very docile animals. Their gentle disposition makes them a pleasure to work with. Accidents while working with cattle are almost unheard of among Speckle Park breeders. A well known fact in Canada. Speckle Park animals are becoming a popular choice of 4-H beef members (Junior Breeders) throughout Canada. Their moderate size and quiet disposition make them manageable by even the youngest 4-H members. It is unbelievable how easily some of them halter break. As one 4-H member put it, "They almost halter break themselves." Speckle Park rarely experience difficulty calving. The small front shoulders of the newborn calf make for calving ease. 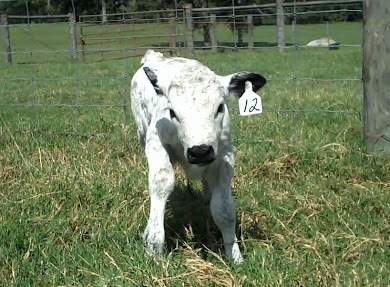 The calves come into the world at approximately 35kg. and are very vigorous at birth. Most newborns are up and sucking in minutes. Cattlemen world wide know that a great deal of time and expense is saved and the bottom line is greatly enhanced by breeding cattle that can calve unassisted. It isn't uncommon in today's society to see the wife caring for the cattle while the husband works off the farm to supplement farm income. Speckle Parks are a wise choice for farmers in this situation. The calves weigh a fraction of the weight of those of the exotic breeds and a lot less than most other British bred cattle. Almost all Speckle Park cows, even the heifers, calve unassisted. Speckle Parks are a docile breed, the cows are very maternal when it comes to caring for their young. They have good udders, with many people commenting on their great udder, teat shape and length of teats. They turn off sappy well grown calves from a young age. 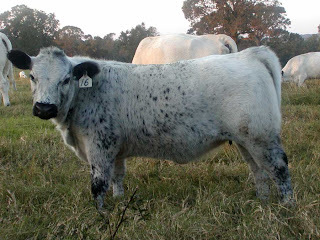 Commercial breeders are finding Speckle Park bulls a wise choice for breeding heifers. They not only decrease the size of the newborn calf and increase calving ease but also increase the quality of the resulting carcass. It's offcially hunting season in Texas, and the modern day deer hunters are stalking their seasonal prey. Hunting these days bears little reflection to the hunting methods of old. 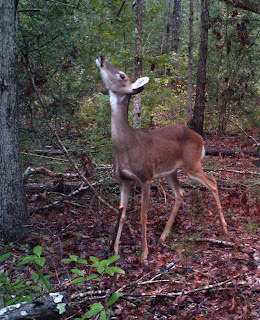 The photos in this blog were taken by a motion activated camera set deep in the woods. Either corn or a mineral lick were the attraction for the deer and they cooperated quite well, with numerous shots of them moving through the area. 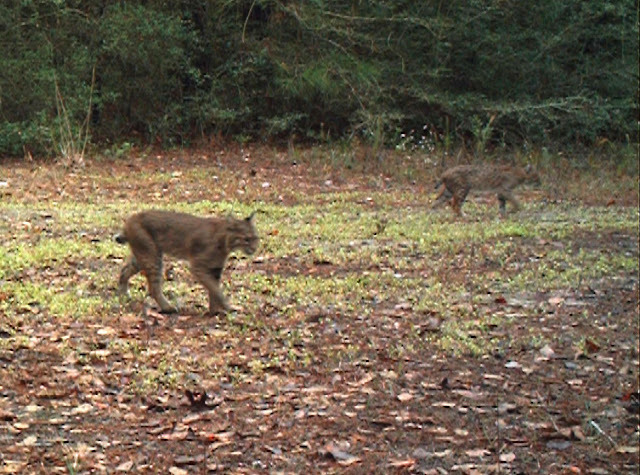 Also of interest were the large numbers of coyote, and three different bobcats (see a Bobcat photo below). 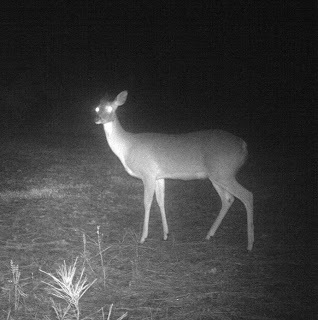 While the intent of the camera is to determine when the deer can be found at a particular time of day and place for convenient shooting, the photos for the naturalist type are of great interest. Seeing the East Texas woods alive with its native animals is well worth the effort, and one of the better benefits of modern hunting methods. The following excerpt makes reference to the style of the hunt for deer and other wildlife in medieval times when the success of the hunt was paramount to survival. While today's hunters largely hunt for sport, there are definitely many hunters in East Texas who still hunt to fill their freezers with much needed meat for their families through the coming year. It is those hunters who need it most for food that largely have the least opportunity to hunt. In that respect today's costly deer leases serve to provide meat and sport to those who least need the meat. ". . .will here be content with quoting the following remarks of Mr. Earle in his edition of the Saxon Chronicle. " Now-a-days," he says, "men hunt for exercise and sport, but then they hunted for food, or for the luxury of fresh meat. Now the flight of the beast is the condition of a good hunt, but in those days it entailed disappointment. They had neither the means of giving chase or of killing them at a distance, so they used stratagem to bring the game within the reach of their missiles." "A labyrinth of alleys was penned out at a convenient part of the wood, and here the archers lay under covert. The hunt began by sending men round to break and beat the wood, and drive the game with dogs and horns into the ambuscade. The pen is the haia (1) so frequently occurring amongst the silvae (2) of Domesday." "Horns were used, not, as with us, to call the dogs, or, as in France, to signal the stray sportsman; but to scare the game. In fact it was the battue (3) which is now, under altered circumstances, discountenanced by the authorities of the chase, but which, in early times, was the only way for man to cope with the beasts of the field."" 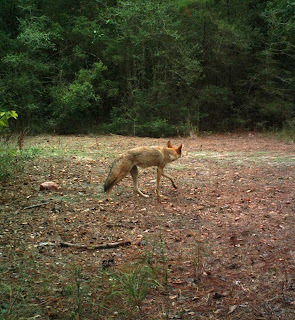 These days the East Texas woods have entirely too many 'beasts' of the coyote type. They are quite bold, and most old-timers will tell you they are much bigger in stature now and bolder than in their earlier memories. In England it was the wolf that was a threat to other wildlife. "In the Forest Laws of Canute promulgated in 1016 the Wolf is thus expressly mentioned: As for foxes and wolves they are neither reckoned as beasts of the forest or of venery and therefore whoever kills any of them is out of all danger of forfeiture or making any recompense or amends for the same. Nevertheless, the killing of them within the limits of the forest is a breach of the royal chase and therefore the offender shall yield a recompense for the same, though it be but easy and gentle." Harting, 1880. The wolf was hunted to extinction in England by the time of Henry VII, sometime between 1485 - 1509. "The old books on hunting state that the season for hunting the Wolf was between the 25th of December and the 25th of March. This of course was only so long as Wolf hunting was an amusement and a royal sport. As soon as it became a necessity and a price was set on the animal's head, it was killed whenever and wherever it could be found. ". . .during the reign of Henry VII it is probable that the Wolf became finally extirpated in England. Although for nearly two centuries later . . . it continued to hold out against its persecutors in Scotland and Ireland." Harting, 1880. (1) Hay Latin, haia. Haia, sometimes rendered as hay, is translated as both 'enclosure' and 'hedged enclosure' in the Phillimore edition. The term is first recorded in Domesday Book. The haia was an enclosure formed by a hedge of trees, designed to trap or corral wild animals, usually deer, during the hunt. A number of Domesday entries refer to the enclosures 'where wild animals were caught' (eg, WOR 18,4), others to enclosures where the animals were kept (HEF29,11). (2) Silvae, the word means woods or thicket, and implies unpruned luxuriance of growth. (3) Battue, an old term referring to using people or dogs to drive animals from the woods. A great read, have some patience and read the whole of this very old article, and very old rational and factual argument. 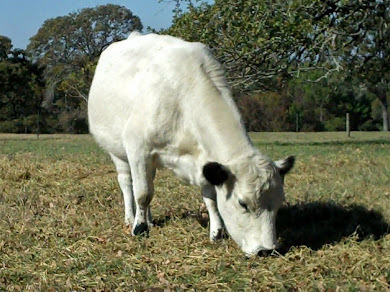 It strikes me as sad, as well as asinine, that pure fact and rational argument was ignored then and remains ignored today in the works of so-called authorities on the origin of the horned Chillingham and White Park Cattle as compared to the polled British White (known as the polled Park breed prior to the late 1940's). 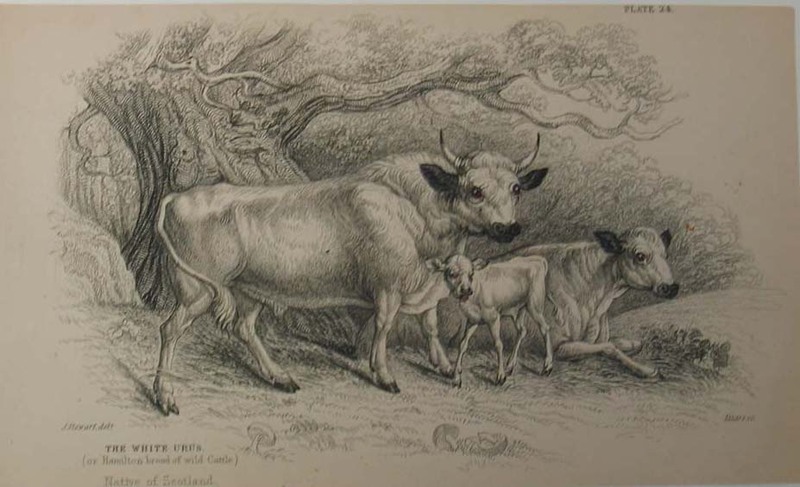 Both the horned and polled ancient Park Cattle were recorded in the same Park Cattle Society herd book for many many years, bred in the same pastures for hundreds of documented years, yet politics and old money influence have continued to abominably skew the real history of the polled and horned Park Cattle in the interests of presenting the horned Chillingham herd of cattle as a bovine uniquely blooded and bonded to the history of the British Isles above and beyond that of either the horned or polled ancient Park cattle-- which is an absurd fiction fast becoming accepted as factual history. The breeders of both polled and horned ancient Park Cattle need to find a common ground, a mutual wish for resolution, and let the sophisticated science of today explore and resolve this relatively new quibble in the broad spectrum of the history of the horned and polled Park Cattle which reaches back in time before the advent of the written word. 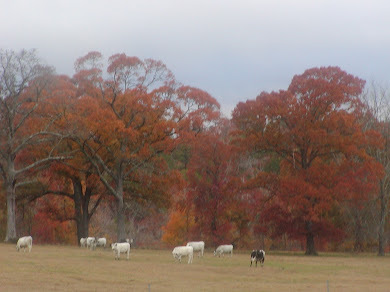 This video shows four British White heifers at pasture in late October. These pretty little girls were sired by J.West's Carter, an unusual small young bull produced by a double Popeye daughter and J.West's Mazarati. 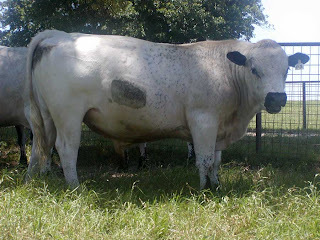 Carter is thick and masculine, all you could want in a herd sire -- yet he is also very short. At most he will mature to a Frame Score 2, but just barely if he does. The decision to give this little guy a try on a set of open heifers last December wasn't made lightly. Would his calves have low birth weights? average birth weights? Or even above average as a potential consequence of linebreeding? Odds seemed best they would be low to average birth weights. Then there was the question of just what would I do with the offspring if they were indeed small. A wise man told me long ago that it was a whole lot easier to make your cows smaller than it was to make them larger once again. But, there is a growing interest in smaller cattle for grass fed beef operations and for small farms, so I decided to give Carter a shot at producing true British White Fullbloods of a thick lowline rather than a 'mini' cattle stature. I think it has been a good decision, and I couldn't be more pleased with the birth weights, or with the heifers. The first calf born on Sept. 21 was out of Stella, an El Presidente daughter, and she had an actual weight of 48 pounds, and taped 24". The next calf born was out Merry Marie, an Elvis daughter, and she had an actual weight of 59 pounds, and taped 25". The next was out of Doc's Gal, a Mazarati daughter and also a half sister to Carter, and she had an actual weight of 54 pounds and taped 24.5". The last calf born was out of Elsie Eve, another El Presidente daughter, and she had an actual weight of 55 pounds -- with a taped 27" girth! I checked, it wasn't a mistake, she is a very thick little heifer.